Camp Death III was obviously a labour of love, how did it start? What gave you the ideas? The idea came to me while I was out kayaking on a lake not dissimilar looking from 'Camp Crystal Lake.' So I paddled back to shore and started casting the film about a week later... without a script. Once you knew what you were doing, how difficult was it to turn those ideas into an actual movie? Creative stuff was a breeze. I have many deficiencies but running low on moronic (but creative) ideas is not one of them. Logistical stuff (money/organization) was much less easy (and fun) but somehow we hobbled thru to the finish line. What kind of horror movies and comedies did you grow up loving? How did those inform your script? The first 5 Friday the 13th movies were hugely influential as were absurdist comedies such as Top Secret! and Airplane! Also, being Canadian (and having British parents) I was brought up on absurdist UK stuff such as Monty Python and Benny Hill. Smash those two together and you have Camp Death III in 2D! There are plenty of names in the credits for the screenplay, how did that come about? Did everyone keep coming up with jokes as you made the movie? Almost every cast member was given a 'story' credit because they provided some improvised dialogue (and ideas) on set. However, for the most part we were just following the script that I had written. Did you feel you were in a grand tradition of Canadian horror movies, no matter how irreverent you were? Not really. When I think of Canadian Horror I think of 'My Bloody Valentine, Black Christmas, Prom Night etc. which are pretty standard, by-the-numbers horror films. However, I certainly feel there is a irreverent Canadian comedy element to what we created. Seeing that we have a cultural connection to the Brits, our comedy tends to be much more absurdist than our neighbors to the south. Were there many gags you left out? If so, care to give any examples? Oh lord, yes. I have (at least) 35 minutes of completed scenes I tossed from the final version of the film. Good news (for us at least) is that they'll see the light of day sometime in the Spring through the extended cuts. One example is a scene in which Uncle Mel (Darren Andrichuk) is tied to a tree by his wife, Mavis (Caroe Sandoval) who then proceeds to torture him by stabbing (with a fork) the festering boils on her backside. Of course the boils explode and are jettisoned over Mel's face. It is a repugnant and utterly irredeemable scene but heck, I think it's pretty funny. Friday the 13th Part 3D was an obvious inspiration. Are you a fan of 80s slasher pics in particular, and why did you find them ripe for parody? Yes! Huge fan of the first 5 Fridays and other slashers of that time period. I think the reason they are so ripe for parody is because they are fundamentally dumb movies. The plots are dumb. The characters are dumb and they make dumb decisions. Because I have such love for the genre it is painful for me to admit that these movies are, in the scheme of things, DUMB. The 1980s are still very much in vogue at the moment (the latest Transformers movie is even set there). Do you have any great affection for the decade, or does it look kind of ridiculous to you in hindsight? I was 9 to 19 years of age during that decade so I lived it fully. Sure, certain films and music are nostalgic for me but that decade was as tricky to navigate as those that followed. I don't pine for the 80's at all and I don't see it as being any more ridiculous than any of the other five decades I have lived thru, really. How easy has it been to get distribution? Could you give budding moviemakers any advice? Amazon Prime sounds impressive but anyone with a film can get their film on it. Even though we had a couple of offers from distributors, I decided to go the self distribution route as I wanted to release the film quickly and retain control over the direction of it. As for advice for other filmmakers, um... make sure you get good sound? Lastly, what are your plans for the future? Will we be seeing a sequel, or something new? 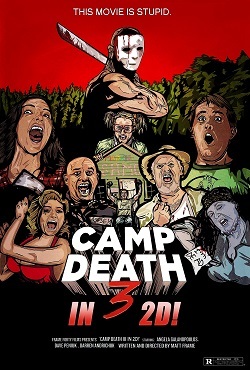 The only film on the horizon for me is the sequel Camp Death III, Part II, in 3D, which we'll shoot in true 3D. Whether I'll get the chance to make it is another story entirely. These things are a bit of a slog, you know? But fingers crossed!